Does it Taste Like Dairy Milk: No, it tastes so much better! I am quite literally obsessed with this stuff. Its viscosity is similar to dairy milk. It has a smooth clean taste, not too nutty or with too strong of a coconut taste. 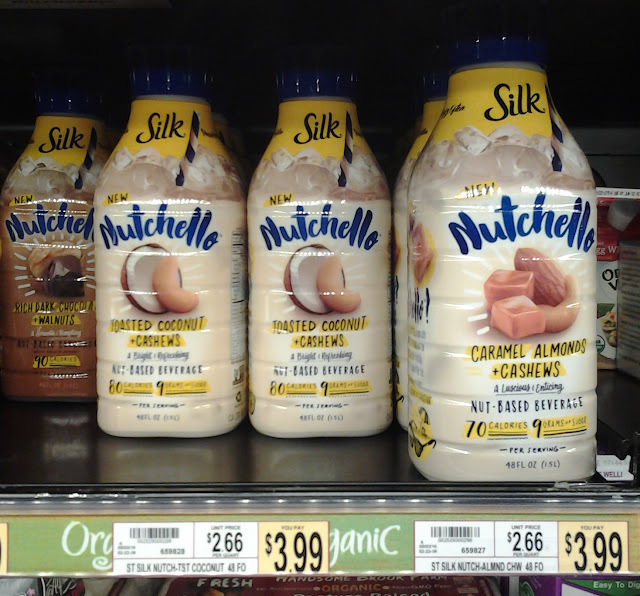 I use the Silk Toasted Coconut + Cashews Nutchello when I need a plain non-dairy milk for cooking. It's also what my Hubby prefers to drink. The Silk Rick Dark Chocolate + Walnuts Nutchello is like drinking liquid chocolate pudding. Literally. I have it in place of dessert when I run out of my favorite ice cream. Will Dairy Milk Drinkers Drink It: Yes, I think not only will they like it, but they'll be surprised at how good it is. that were not dairy-industry funded can be provided) dairy milk has been linked to obesity, dementia, depression, osteoporosis and its production is directly linked to the destruction of our environment and a lifetime of torture, abuse and misery for cows. Go ahead and Google "dairy industry abuse." Would I Buy it Again: Um...Hell yeah! I buy it all the time. I know this is a little more expensive than other non-dairy milk. For me. it's worth it, because I just love how amazing they taste. If I have to use a lot of unsweetened non-dairy milk for a recipe, I'll buy whatever is on sale. Or I'll whip up a batch of soy milk. It's also more expensive than a gallon of milk, I get that. But, considering the health benefits and the lack of animal cruelty, it's worth it. The writer has perfectly mentioned about the vegan chocolates. I trully admire the opinions given here. There are a lot of vegan chocolate suppliers available now and that is the reason I get the best vegan chocolate dishes ready.